The newly ordained are celebrating their First Masses. I had a note about the First Mass of a new young priest in San Francisco. Preparation for the Mass was a joint effort of Saints Peter and Paul and St. Margaret Mary in Oakland, with assistance from St. Patrick’s Seminary, and San Francisco’s Star of the Sea and St. Monica’s Churches. The Mass was videotaped and photographed by Jay Balza, of the Traditional Latin Mass Society of San Francisco. More of the photos may be seen on his Facebook page. This entry was posted in Brick by Brick, Fr. Z KUDOS, Liturgy Science Theatre 3000 and tagged Archd. San Francisco, Brick by Brick, first Mass. Bookmark the permalink. Thanks be to God!! Me and my wife attended this Mass. We were both so amazed with the architecture and how the Traditional Latin Mass was so beautiful. It saddens me to know that there are folks out there who reject their patrimony and deny the beauty of our Catholic traditions. Thank you for sharing this Padre, it was a big deal for us here in the SF Bay Area, California. That Cranmer table altar in front looks very silly. The main altar is awesome! I attended this Mass also. Believe me the vestments close up were…I do not have the words to describe them. And the chant from the choir loft was heavenly. The church is amazing and retains communion rails on the sides even if there are none in the center. It’s run by the Salesians. Father Yu’s first Mass of Thanksgivng in the Ordinary Form was also at this church. I did not attend but I saw some photos online. I believe there as many people at this EF Solemn Mass! He will offer another EF Mass of Thanksgiving in August at St. Margaret Mary (ICKSP) in Oakland. This young priest is the real deal! Afterwards, in speaking to some seminarians who had taken part, I found out the good news that there are more young men coming up who will be priests who know (and love) the Extraordinary Form. Pray for St. Patrick’s Seminary! Archbishop Cordileone is in charge now! We are blessed here in what might appear to be the belly of the beast. That is my favorite in no small part because I made the decision to join the a church there when we were in SF for the Walk for Life. 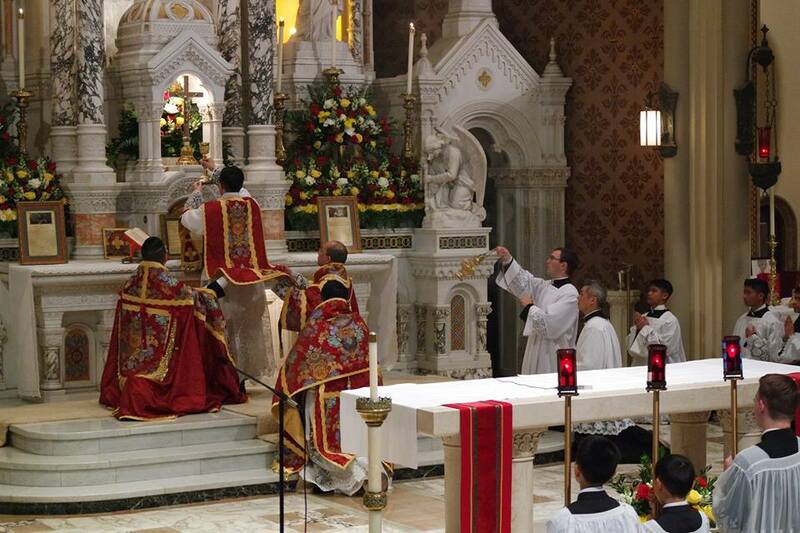 Wonderful to see the TLM being offered there. A few years ago my wife and I attended Mass at this church while visiting San Francisco. We heard the sounds of guitar , not chant from the choir loft. A great change!